​​​HISTORY: 1319 is a 72-seat coach was built by Pressed Steel Car Company in 1931 and later became New Jersey Transit car #5151. 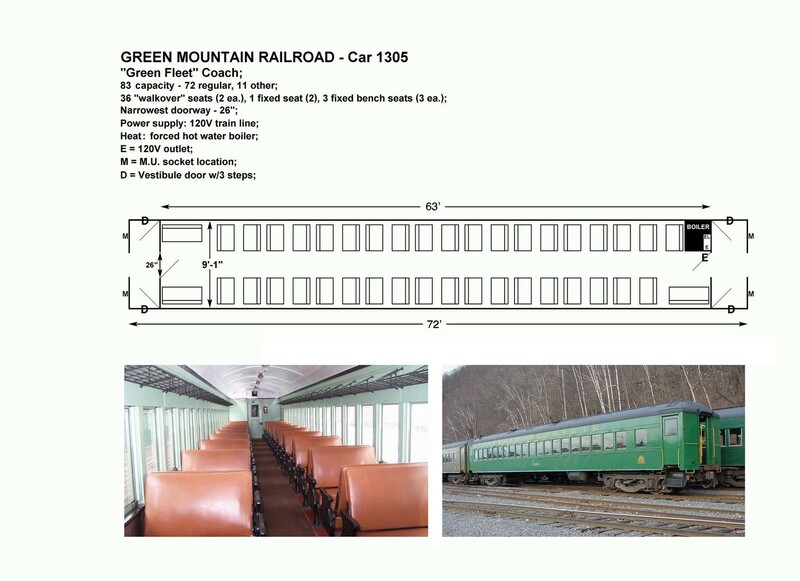 It became the property of the Green Mountain Railroad in October of 1984, as a control cab-equipped car. The cab has been removed and replaced with vestibule restrooms. HISTORY: Car 1301 is one of 25 former Central Railroad of New Jersey (CNJ) 76-seat steel commuter coaches built in 1930-1931 by Pressed Steel Car Company. 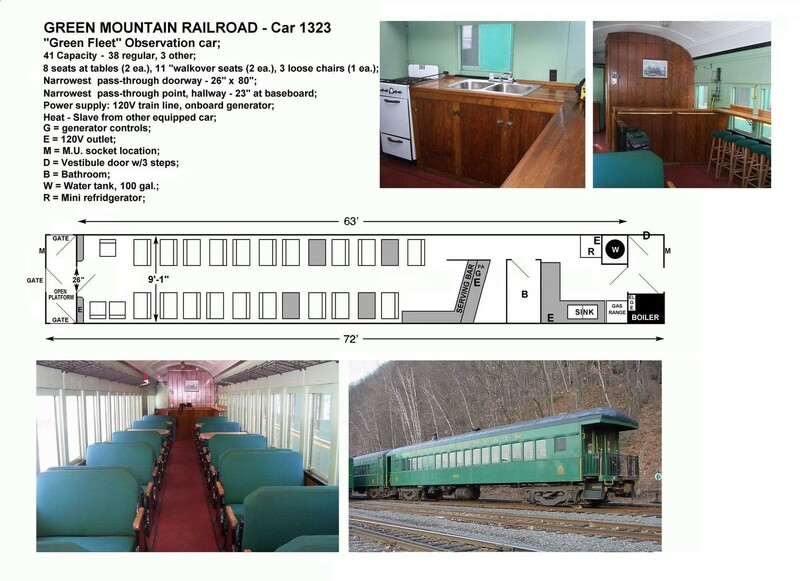 The car was sold by New Jersey Transit in September 1984, to the Winnipesaukee Railroad. In June of 2001, the car sold to the GMRC. 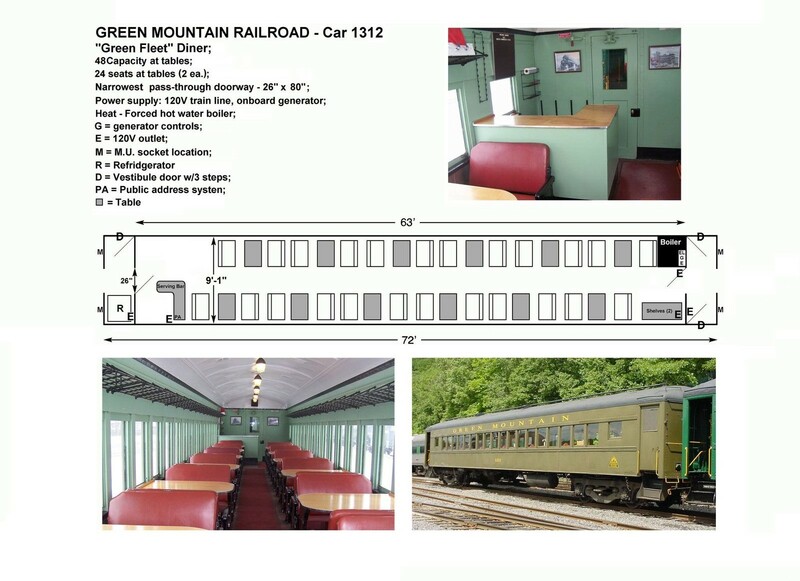 Car 1301 has since been converted into a 48-seat dining car with a small serving counter on one end. HISTORY: Car 1312 was also part of the former CNJ series of 76-seat steel commuter coaches. 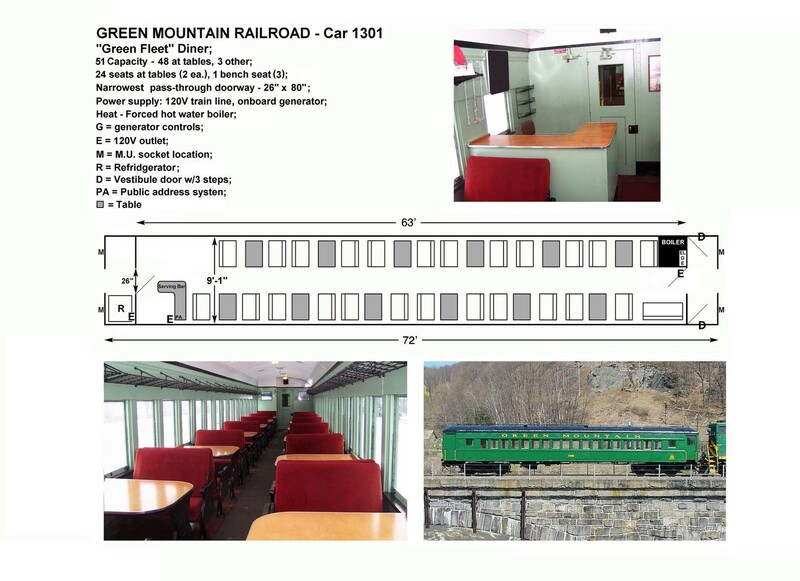 It came to the Green Mountain Railroad on July 16, 1984. 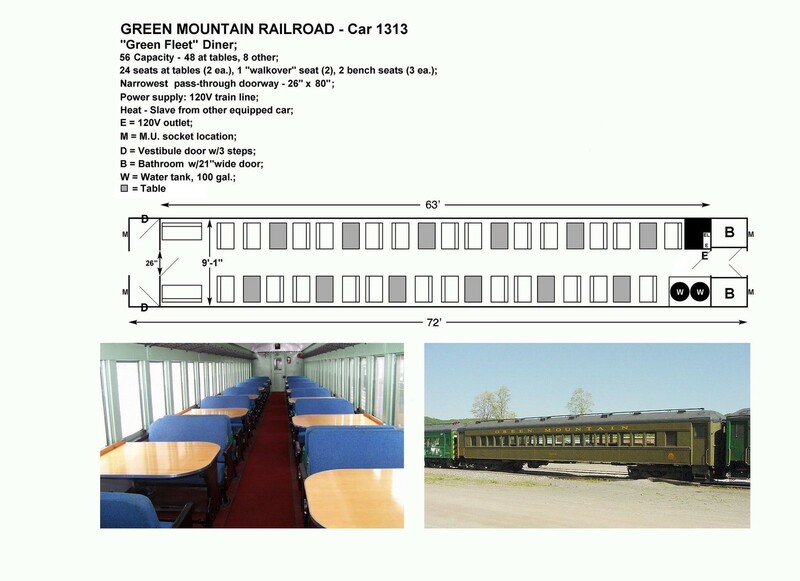 It has since been converted into a 48-seat table car with a small serving counter on one end. HISTORY: Car 1323 is a former CNJ coach that was bought by the Vermont Railway in May 1984. 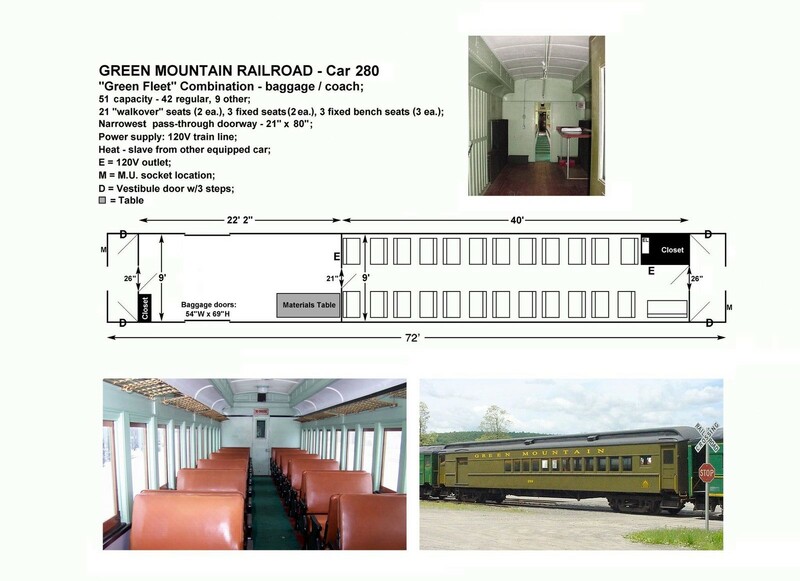 It was rebuilt into an observation car with coach searing and a serving bar. 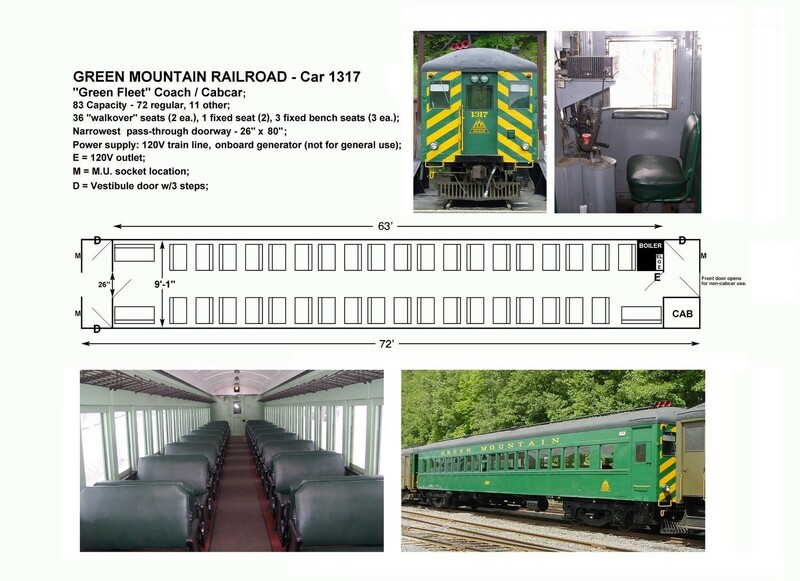 The Vermont Rail System has assigned this car to the Green Mountain Railroad to go along with the others. HISTORY: Car 1317 is a part of the former CNJ series of 76-seat steel commuter coaches. This car was rebuilt with a control cab on one end to allow push-pull operations. GMRC bought the car in October of 1984 and arrived at GMRC with the ends sealed. The car end has been opened up and had train doors added for mid-train use. Today, the cab control still works and the car seats 72 in walkover seats.